For other uses, see Arras (disambiguation). The Arras plain lies on a large chalk plateau bordered on the north by the Marqueffles fault, on the southwest by the Artois and Ternois hills, and on the south by the slopes of Beaufort-Blavincourt. On the east it is connected to the Scarpe valley. Established during the Iron Age by the Gauls, the town of Arras was first known as Nemetocenna, which is believed to have originated from the Celtic word nemeton, meaning 'sacred space'. Saint Vedast (or St. Vaast) was the first Catholic bishop in the year 499 and attempted to eliminate paganism among the Franks. By 843, Arras was seat of the County of Artois which became part of the Royal domain in 1191. [unreliable source?] The first mention of the name Arras appeared in the 12th century. Some hypothesize it is a contraction of Atrebates, a Belgic tribe of Gaul and Britain that used to inhabit the area. The name Atrebates could have successively evolved to become Atrades, Atradis, Aras and finally Arras. Others believe it comes from the Celtic word Ar, meaning 'running water', as the Scarpe river flows through Arras. Louis XIII reconquered Arras in 1640; the town officially became part of France in 1659. Each year Arras attracts thousands of visitors, who explore the city's architecture and historic buildings. Some famous attractions include the splendid Town Hall and its Belfry (listed as an UNESCO World Heritage Site since 15 July 2005), the "Boves" (a maze 10 m (33 ft) beneath the city), the Squares (La Place des Héros and La Grand'Place), the Art District (the Theatre of Arras and the Hôtel de Guînes), the Abbey District (The Saint-Vaast Abbey and the Cathedral of Arras), the Vauban Citadel, and the Nemetacum site (the ancient town founded by the Romans 2000 years ago). The Canadian National Vimy Memorial is just outside the town. Archaeologists found evidence of prehistoric human settlements in the Scarpe basin. The archaeological sites of Mont-Saint-Vaast in Arras and Biache-Saint-Vaast were Stone Age settlements of the Mousterian culture. They were evidenced by the finds of stone tools. These tools show signs of the Levallois technique, a name given by archaeologists to a distinctive type of stone knapping, developed by forerunners to modern humans during the Paleolithic period 170,000 years ago. In the 4th century, Nemetacum was renowned for its arts and crafts as well as textiles trade throughout the whole empire. Between 406 and 407, the city was taken and destroyed by Germanic invaders. In 428, the Salian Franks led by Clodion le Chevelu took control of the region including the current Somme department. Roman General Aetius then chose to negotiate for peace and concluded a treaty (fœdus) with Clodion that gave the Franks the status of «foederati» fighting for Rome. The town's people were converted to Christianity in the late 4th century by Saint Innocent, who was killed in 410 during a barbarian attack on the town. In 499, after the conversion of Clovis I to Catholicism, a diocese (évêché in French) was created in Arras, the Roman Catholic Diocese of Arras, and given to Saint Vaast (also known as Saint Vedast in English), who remains the diocesan patron saint. Saint Vaast then established an episcopal see and a monastic community. It was suppressed in 580 to found the Roman Catholic Diocese of Cambrai, from which it would reemerge five centuries later. Arras remained under Habsburg rule from 1493 until 1640 when it was captured by the French. The Spanish ceded it by the peace treaty in 1659 and it has since remained French. The Union of Arras was signed here in January 1579 by the Catholic principalities of the Low Countries that remained loyal to King Philip II of Habsburg; it provoked the declaration of the Union of Utrecht later the same month. 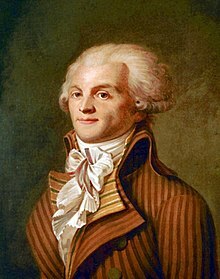 Maximilien de Robespierre, a French lawyer and politician from Arras and one of the best-known and most influential figures of the French Revolution, was elected fifth deputy of the third estate of Artois to the Estates-General in 1789. Robespierre also helped draft to Declaration of the Rights of Man and of the Citizen. During the French Revolution, the city of Arras was first presided over by French reformer Dubois de Fosseux, erudite squire, secretary of the Arras district (arrondissement in French) and future president of the Pas-de-Calais department. Around the same time, competing against Aire-sur-la-Lys, Calais and Saint-Omer, Arras won the prefecture of Pas-de-Calais. From September 1793 to July 1794, during the Reign of Terror, the city was under the supervision of Joseph Lebon who implemented food restrictions, ordered 400 executions and destroyed several religious monuments including the Arras Cathedral and the Abbey of St. Vaast. Arras' demography and economic activity remained the same throughout the French Revolution while Lille's grew exponentially. In 1898, under the influence of Mayor Émile Legrelle, some of Arras' ramparts were demolished to build vast boulevards, establish a new sewage system and replace the old railway station from 1846. During most of the First World War, Arras was about 10 kilometers (6.2 miles) away from the front line, and a series of battles were fought around the city and nearby, including the Battle of Arras (1914), the Battle of Arras (1917) and the Second Battle of the Somme component of 1918's Hundred Days Offensive. On 31 August 1914, German light cavalry (Uhlans) arrived in Tilloy-lès-Mofflaines, and an army patrol made a foray into Arras. On 6 September 1914, 3,000 soldiers led by General Hans-Jürgen von Arnim barracked within the city and in the citadel. Shortly after, Louis Ernest de Maud'huy's soldiers partly repelled the German army troops, and trenches were dug in the Faubourgs d'Arras. On 7 October 1914, the city hall burned. On 21 October 1914, the belfry was destroyed, and so was Arras Cathedral on 6 July 1915. In 1917, a series of medieval tunnels beneath the city, linked and greatly expanded by the New Zealand Tunnelling Company, became a decisive factor in the British forces holding the city particularly during that year's Battle of Arras. 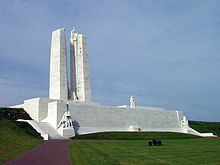 The town is located approximately 11 km (6.8 mi) south of the Canadian National Vimy Memorial built in 1936 on Hill 145, the highest point of the Vimy Ridge escarpment. It is dedicated to the Battle of Vimy Ridge assault (part of the 1917 Battle of Arras) and the missing First World War Canadian soldiers with no known grave; it is also the site of two WWI Canadian cemeteries. On 9 April 2017, the 100th anniversary of the Battle of Vimy Ridge, Arras Mayor Frédéric Leturque thanked Canadians, as well as Australians and British, New Zealanders and South Africans, for their role in the First World War battles in the area. In the early stages of the second World War, during the invasion of France in May 1940, the city was the focus of a major British counterattack. Arras saw an Allied counterattack against the flank of the German army. The German forces were pushing north towards the channel coast, in order to entrap the Allied Forces that were advancing east into Belgium. The counterattack at Arras was an Allied attempt to cut through the German spearhead and frustrate the German advance. Although the Allies initially made gains, they were repulsed by German forces and forced to withdraw to avoid encirclement. Arras was then occupied by the Germans and 240 suspected French Resistance members were executed in Arras citadel. On 3 September 1944, the city was entered and liberated by the British Guards Armoured Division. In September 1993, Ipswich (United Kingdom) and Arras became twin towns, and a square in the new Ipswich Buttermarket development was named Arras Square to mark the relationship. Arras is located in northern France in the Hauts-de-France region. Hauts-de-France is divided into 5 departments: Nord, Pas-de-Calais, Somme, Oise, Aisne. 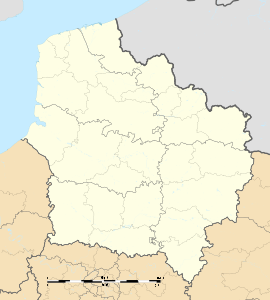 Arras is in the south-east part of the Pas-de-Calais department and forms the Arras district (arrondissement d'Arras in French) in the Artois, a former province of northern France. The city's total area is 11.63 km2 (4 sq mi). The lowest point in the city is at 52 meters (171 feet) above sea level and the highest is at 99 meters (325 feet). The level of earthquake hazard in the Arras area is low, as it is in the whole Pas-de-Calais department. Arras mainly experiences a Western European oceanic climate (Köppen climate classification: Cfb) affected by the North Atlantic Current due to its proximity of the English Channel (La Manche in French). The city's climate is characterized by frequent rains in all seasons, and temperatures throughout the year are mild because of the proximity of the sea. The thermal amplitude is generally low. However, the city can sometimes endure brief cold temperatures as it is at the crossroads between oceanic and continental influences. Therefore, the region's climate can also be referred as semi-oceanic (known as a Climat océanique dégradé in French). Rain falls throughout the year. Average annual precipitation is 742.5 millimetres (29.23 in) with light rainfall fairly distributed throughout the year. The highest recorded temperature is 36.6 °C (97.9 °F), and the lowest is a −19.5 °C (−3.1 °F). On 28 October 2013, Cyclone Christian (also known as the St. Jude storm), one of the strongest extra-tropical cyclones ever recorded, hit Northern Europe including the Arras area. The cyclone's central pressure was 981 mb, and wind speeds reached a maximum of 121 km/h (75 mph). The city of Arras did not experience any major damage though. As of 2012[update], the population of Arras is 43,693 for a density of 3,756.92 people per square kilometre (9,880.69 per square mile). The residents go by the name of Arrageois (male) and Arrageoise (female). The population is rather young as the highest number of residents is 15-29 of age. The most recent male to female ratio is 100:113, and the female to male ratio is 100:89. There are 20,198 males (47%) for 22,474 females (53%). The Arras metropolitan area has a population of 124,200. The city centre is marked by two large squares, La Grand' Place and La Place des Héros, also called La Petite Place. The two squares are surrounded by a unique architectural ensemble of 155 Flemish-Baroque-style townhouses. These were built in the 17th and 18th century and were initially made of wood. In 1918, after the end of World War I, most of the townhouses were so severely damaged that they had to be restored to their pre-war conditions. They are now made of bricks. The original cathedral was constructed between 1030 and 1396 and was one of the most beautiful Gothic structures in Northern France. It was destroyed during the French Revolution and rebuilt in the 19th century. The present Basilique-Cathédrale Notre-Dame et Saint-Vaast is a minor basilica. The Boves, a well-preserved underground network of tunnels, 10 metres (33 feet) beneath the city, was built in the 10th century and can now be visited by tourists. The idea was to set up a vast underground network to make all inhabitants' cellars interconnect by means of tunnels. Excavation material (chalk) was not wasted but rather used to construct houses. During World War I and World War II, the Boves was utilized as an underground bunker to hide and protect residents and valued objects from falling bombs. The Arras Film Festival is a popular film festival held for ten days in November. The Vimy Memorial is a memorial just north of the town honouring a major World War I battle, the Battle of Vimy Ridge, which marked the first time Canada fielded an entire army of her own. Four Canadian divisions fought there on Easter weekend 1917. The Battle of Vimy Ridge was part of the broader Allied offensive in April known as the Battle of Arras. The Canadian National Vimy Memorial is nearby. Vimy was the only victory the Allies would enjoy during their 1917 spring offensive. The Basilica of Notre Dame de Lorette cemetery, overlooking the nearby village of Ablain-Saint-Nazaire, likewise stands before one of France's largest World War I necropolises. Part of an extensive network of tunnels dug in World War I by British Empire soldiers can be visited at the Carrière Wellington museum in the suburbs. This article incorporates text from a publication now in the public domain: Herbermann, Charles, ed. (1913). "Arras" . Catholic Encyclopedia. New York: Robert Appleton. ^ "Histoire Générale - Arras-Online". arras-online.com. Retrieved 30 October 2014. ^ "ARRAS Historique". nordmag.com. Retrieved 30 October 2014. ^ a b "Mairie de ARRAS (62000) - Conseil-General.com". conseil-general.com. Retrieved 30 October 2014. ^ "Arras in Nord-Pas-de-Calais -- a Guide to Arras in northern France". gofrance.about.com. Retrieved 30 October 2014. ^ "Discover the heritage of the city of Arras - Arras Tourism Office". explorearras.com. Retrieved 30 October 2014. ^ "Arras an Unburied City" (PDF). The New York Times. December 12, 1915. Retrieved 2015-08-16. ^ Johnson, Matt (20 April 2011). "Legacy of the Kiwi tunnellers". Stuff.co.nz. Retrieved 16 September 2011. ^ a b "Canadian National Vimy Memorial, France". The Great War UK. The Great War UK. 2015. Retrieved 31 March 2017. The ridge runs in a direction from Givenchy-en-Gohelle in the north-west to Farbus in the south-east. ^ The Canadian Press (9 April 2017). "Canadian and French leaders pay homage to fallen soldiers at Vimy Ridge". National Newswatch. National Newswatch Inc. Retrieved 7 April 2017. ^ "Ipswich – Arras". Ipswich Borough Council. Archived from the original on 30 May 2008. Retrieved 6 May 2008. ^ "Actualité Météo : Hiver 2013-2014 : douceur exceptionnelle et arrosage copieux - La Chaîne Météo". actualite.lachainemeteo.com. Retrieved 30 October 2014. ^ "The New York Times". nytimes.com. Retrieved 30 October 2014. ^ "Climatological Information for Arras, France". Météo-France. August 2011. ^ "POPULATION ARRAS : statistique d'Arras 62000". cartesfrance.fr. Retrieved 30 October 2014. ^ "La Grand Place - Arras-Online". arras-online.com. Retrieved 30 October 2014. ^ "Le Beffroi et Place des Héros - Arras-Online". arras-online.com. Retrieved 30 October 2014. ^ "Citadelle Vauban - Arras". arras.fr. Archived from the original on 1 January 2015. Retrieved 30 October 2014. ^ Fabien Lemercier (14 November 2016). "Glory tastes victory at Arras". Cineuropa. Retrieved 15 November 2016. Wikivoyage has a travel guide for Arras. Wikimedia Commons has media related to Arras.